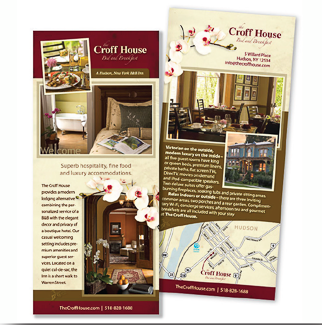 Rack cards are typically 4" x 9" cards found in display racks in hotels, rest stops, tourist bureaus or used at POP (point of purchase) displays near a check out terminal. Effective rack cards will catch your potential customers' eye and quickly convey who you are and what you are offering to your customer. Rack cards should be kept simple and not cluttered with too much information. Keep your message to a couple of paragraphs of text and include a map, a phone number, your website address and, reservation instructions (if appropriate). Many companies will offer a discount on the rack card as an incentive to get potential customers to try their service or products.